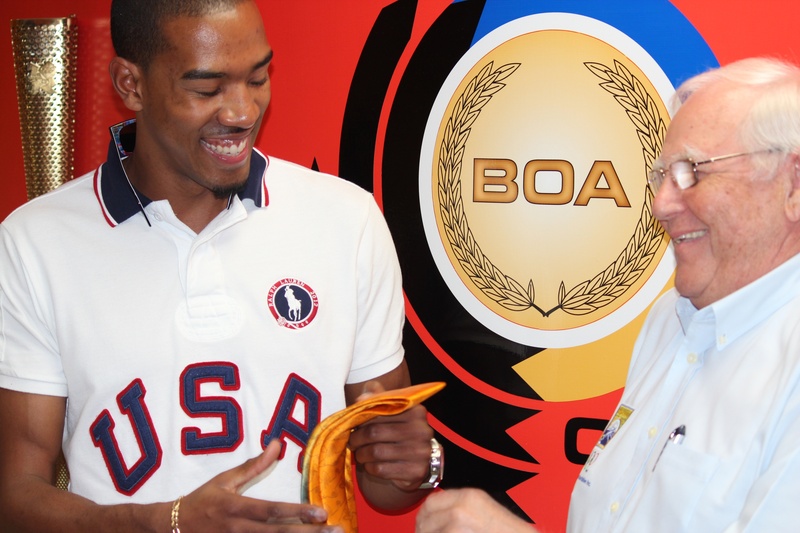 Olympic Goal Medallist Christian Taylor Visits the BOA – Barbados Olympic Association Inc.
History was in the making yesterday at the Barbados Olympic Association Inc. headquarters in Wildey. For the first time ever, there were two Olympians of Barbadian decent present in the building. The atmosphere was magic. 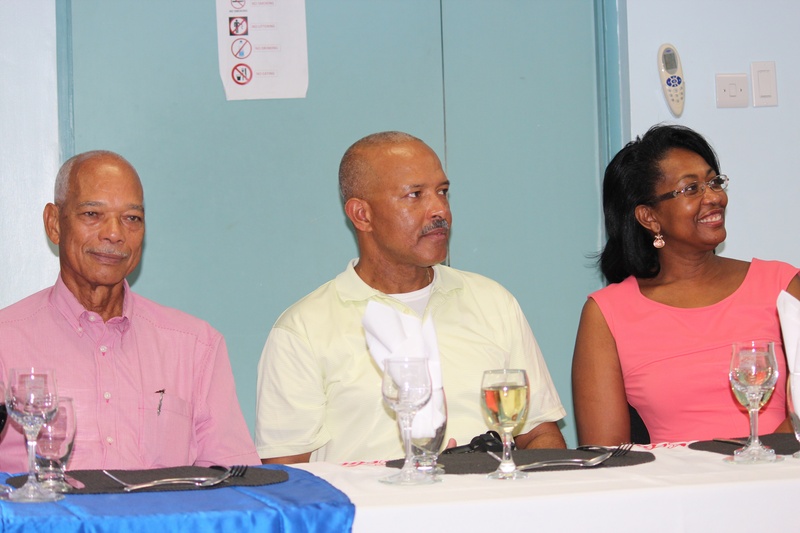 Although Barbados cannot lay claim to the gold medal Christian Taylor won at last year’s London Olympics in the triple jump, we have however laid claim to Taylor. Born of Barbadian parents, he has embraced his Barbadian heritage, admitting that he would have loved to have represented Barbados the first time out, but it did not happen. He is still hopeful of raising a Barbadian flag at the 2020 Olympics. Taylor, accompanied by his family including mom, Stephanie, dad Ian, grandfather Grantley and girlfriend Kelly Murphy met with the President of the BOA Steve Stoute, General Secretary Erskine Simmons and other BOA executives and staff. Stoute expressed the BOA’s pleasure at having the amiable athlete on the island stating that it would be great for the up coming boys and girls to see him and hear of the work he put in to accomplish his success. Manager of the BOA Academy, Dave Farmer, treated the party to a tour of the BOA Museum. 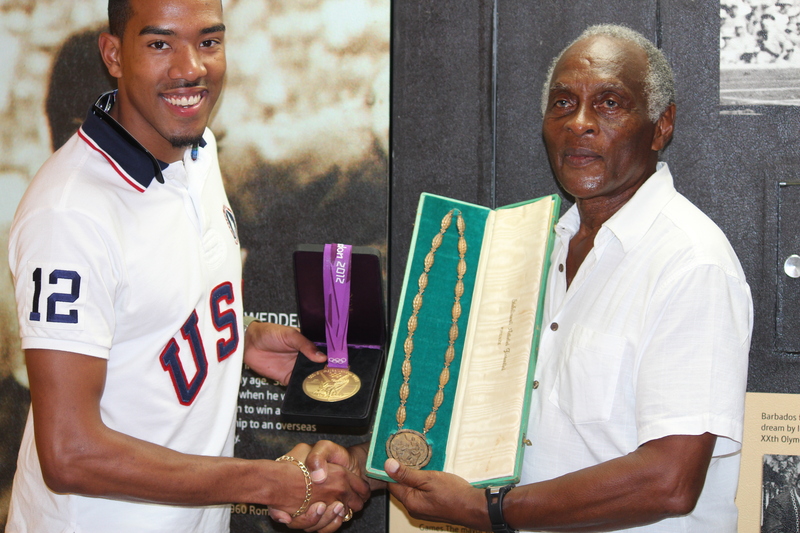 A special feature of the tour was Taylor’s meeting of Barbados’ first Olympic medallist, Jim Wedderburn. Wedderburn won a bronze medal in 1960 as part of a West Indian 4 x 400m relay team. His medal is on display in the museum. The two Olympians got to trade experiences and compare medals. There was also an opportunity for Taylor to speak to the media before lunch, which was hosted on site.